“‘For the earth is full, and there is enough and to spare; yea, I prepared all things, and have given unto the children of men to be agents unto themselves. “‘Therefore, if any man shall take of the abundance which I have made, and impart not his portion, according to the law of my gospel, unto the poor and the needy, he shall, with the wicked, lift up his eyes in hell, being in torment’ (D&C 104:17–18; see also D&C 56:16–17). “Furthermore, He declares, ‘In your temporal things you shall be equal, and this not grudgingly, otherwise the abundance of the manifestations of the Spirit shall be withheld’ (D&C 70:14; see also D&C 49:20; 78:5–7). 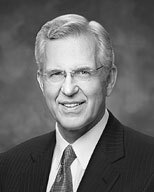 Elder D. Todd Christofferson of the Quorum of the Twelve Apostles, “Come to Zion,” Liahona and Ensign, Nov. 2008, 39.